Tässäpä aihe josta olen ollut innoissani edellisessä työelämässäni. Mielestäni suunnittelijan velvollisuus on suunnitella tuotteet yli out-of-the-box “vau” vaiheen. Kehittyvissä maissa kuluttajille on tärkeää tuotteen jälleenmyyntiarvo. Tämä näkyy siinä kuinka hyvin he suojelevat esimerkiksi kännyköitään: näytöille myydään kontaktimuoveja ja tuotteen ympärille puskuroidut pussukat. Omassa maailmankolkassamme ajattelemme lähinnä automme jälleenmyyntiarvoa. Haaste on suunnitella upeita tuotteita joilla on lupaus säilyä kauniina, eiköstä jookos? This is a topic that i have been very passionate about in my previous working life. We as designers need to have integrity when designing objects to sustain the value – even after the initial “wow” effect when out of the box. In many developing countries, re-sale value is the main thing with purchasing decision. Sure, in this part of the globe, we think the re-sale value of our car when deciding the color for the model. Lets think further, and design around the materials and colors to age beautifully, yes? “By the time you finish reading this, both of these consumer products will have been recycled at a local e-waste facility. 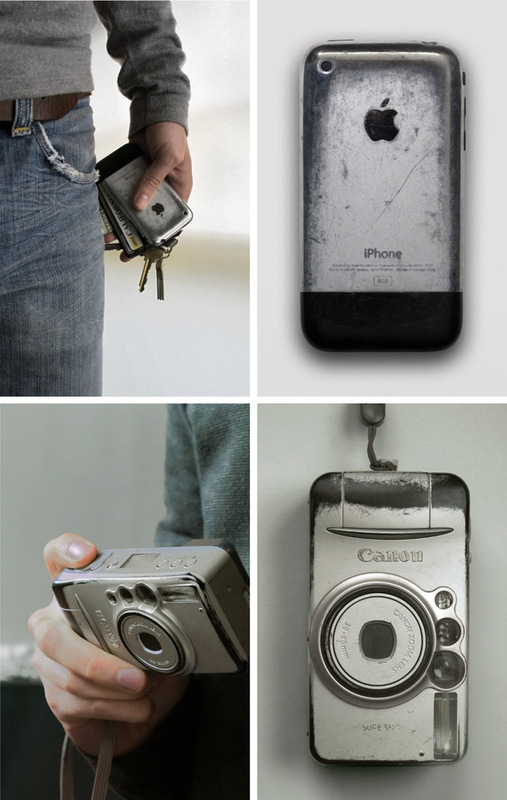 Both the iPhone and the analog Canon served useful lives and have been replaced with their newest counterparts. The iPhone is being retired after 3 years because its touchscreen has stopped working. In contrast, the point-and-shoot camera works like new after 7 full years, but is being retired because it’s not digital. It’s funny how sometimes a low-tech product can outlive a high-tech one because there are fewer components to fail. So here we have two well-worn objects in product purgatory. Before they are sent away to be dismantled and melted away, I’d like to take a moment to examine their materiality and how it has aged with time. At a glance both products are a satin-finish silver color, but upon closer investigation their battle scars reveal the stuff they’re actually made of. After 3+ years of having been carried in the same pocket as a ring of keys, the iPhone has acquired a polished patina over its aluminum shell. Abrasion of its hard-anodized surface has revealed the raw aluminum within. The camera’s shell has been worn in a very similar way but instead reveals black plastic concealed by silver paint. Slightly less flattering. The camera’s emulated metallic finish is only surface-deep and its wear tends to emphasizes awkward artifacts of the injection molding process used to create it. At this point the Canon camera’s shell looks like garbage while the iPhone’s is starting to resemble something more like an heirloom pocket watch.